"You're a poor substitute for Abraham Lincoln." That may have just leaped to the head of the pack for the best denouement of any movie. It's rare that a film with a reputation for being nuts is as nuts as everyone says it is, particularly when said jar of cashews is nearly 50 years old. 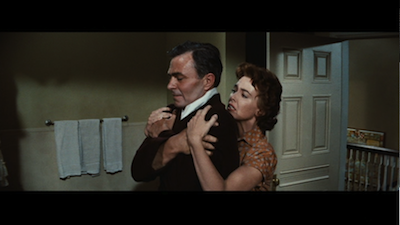 But Nicholas Ray's 1956 subversion of suburbia Bigger Than Life is just as mixed-up as I've always heard, with James Mason's towering title performance worthy of getting his face carved into the Mount Rushmore of acting. Right next to Honest Abe. Bigger Than Life starts out normal enough. At first glance, you'd think it was a light school dramedy. It opens as the day ends at an elementary school somewhere in a faceless neighborhood in America. Smiling children bound out the doors, and the teachers pack up for the day. 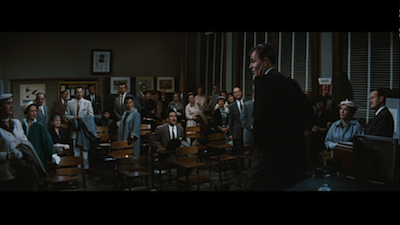 There is James Mason sitting behind his desk, inhabiting the body of Ed Avery, a jocular teacher with a jaunty accent who isn't afraid of flirting with the cute younger woman in the classroom next to him. 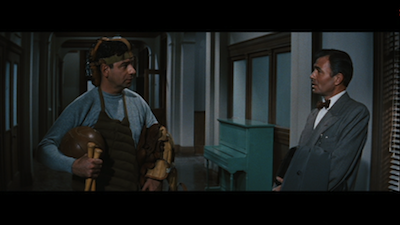 He also trades japes with his buddy Wally, the gym teacher with a strange taste in head gear (a young Walter Matthau, already typecast, it seems). It's all terribly normal. It's like Ed asks his kid Richie (Christopher Olsen) when peeking in on his television habits: "Doesn't this bore you? It's always the same story." The first montage is barely over before the cracks begin to show, but even those start normal enough. To supplement his salary, Ed is secretly working as a taxi dispatch, lying to his wife and claiming he has administrative meetings to attend. He's also hiding the fact that he's having pains in his gut. Ulcers from stress, maybe? It doesn't matter. Ed and his wife, Lou (Barbara Rush), are hosting a dinner party for friends and co-workers. It's only after that the pain becomes unbearable. Ed collapses. He ends up in the hospital, and it's just in the nick of time. Whatever Ed has, it's nearly fatal, and after a battery of invasive tests, Ed's doctor (Robert Simon) decides the new drug cortisone is the only way to treat this malady. It works. Ed is back on his feet, and he's got a new lease on life. Back at work, he's got a spring in his step. At home, he's feeling randy. He insists on taking Lou out and buying her a new dress. He plays football indoors with Richie (this was before "The Brady Bunch" warned us of such things). He's also strangely aggressive, mouthing off and throwing his weight around, and temperamental. Richie and Lou notice it right away, but when they question it, Ed doesn't like it. Long story short, Ed is addicted to his prescription meds and they are making him act this way. Bigger Than Life is quite possibly the first ever movie about abusing pills in Middle America, and unlike the countless Lifetime movies that would follow in its wake, it surprisingly is about a man getting hooked on the poppers, not a bored housewife. 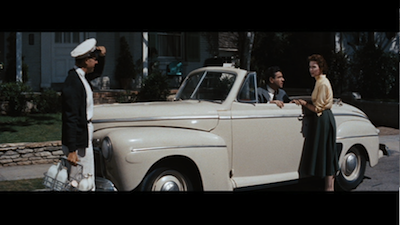 Once Ed is out of the hospital, Nicholas Ray and his pair of writers, Cyril Hume and Richard Maibaum, chronicle the breakneck pace of Ed's breakdown. His skull is a pressure cooker, cranking the heat steadily until the crazy is coming out his ears. Apparently, the story began as a New Yorker article, so there must be some basis in fact here, but who cares? Bigger Than Life gets just as cracked as its main character, and it's fantastic to watch. Mason is a powerhouse as Ed, slowly losing his marbles and getting the jones for his prescriptions. He never overdoes it, there is no slurred speech or anything too comical in how he presents himself. Instead, you can see his mind is burning fuel at a rapid rate, and the conflagrations emerge as all kinds of socially improper behavior and opinions, before settling into dark places when the tank gets empty. Bigger Than Life has a black sense of humor, and there are many laugh-out-loud lines. It ranges from Ed mistakenly thinking that a hypodermic to his sternum means his buttocks ("Sorry," he says when corrected, "I did four years in the navy.") to more abstract jokes on modern psychology. At the school, a young boy shows Ed a twisted painting he has done, and when Ed wonders if the black and red smudge is a thunderstorm, the kid says, "This is a man. He's just mad at his mother." 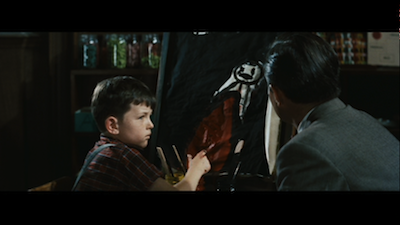 It's even more devilish now, because the kid was Jerry Mathers, who went on to play the Beaver. Youth icons are not safe in Bigger Than Life. 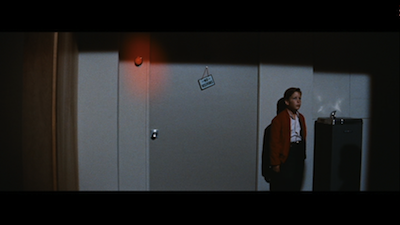 Presumably little Richie's red jacket is Nicholas Ray poking fun at himself. He put James Dean in one just like it a year before in Rebel Without a Cause . Bigger Than Life is not just about gonzo parodies, however; Ray is getting at something about the modern condition, the way we compartmentalize and isolate ourselves in our boxed-off neighborhoods, with psychology and pharmaceuticals and the like. His canvas is the 1950s, but it's still relevant. At Ed and Lou's dinner party, one of the guests tells an anecdote about how she feels she is faced with two options: having a baby or buying a new vacuum cleaner. Do you want a life in the traditional sense, or do you want technological convenience? Likewise, suburbia itself is a façade. Lou tries to keep the secret of Ed's drug-fueled kookiness, but it's hard to be real when the milkman can walk by at any moment. And he literally does; the scene juxtaposes the quaint Norman Rockwell image of American life with the hush-hush perversions each person is trying to hide. It's dangerous to challenge the illusion--and that's just what Ed does. He rails against everything, including family and Christian morality ("God was wrong!" he shouts at one point, and shortly after, very nearly stabs a Bible). At a PTA meeting, he declares that childhood is a congenital disease, and education cures it. Adulthood and reason weeds out the primal impulse. It's ironic, though, because cortisone is giving Ed back his. He's riding entirely on Id and instinct. He struts around like a werewolf--though Conan O'Brien's "Coked-Up Werewolf" more than Jacob Black--or maybe Renoir's Hyde-like Mr. Opale from The Doctor's Horrible Experiment [review]. He's a real creep! The colorful sets and the photography of Joe MacDonald (Niagara , House of Bamboo ) reflect the turmoil Ed is going through. 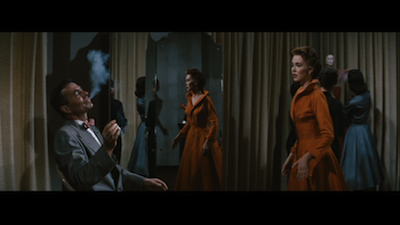 Like a Douglas Sirk movie, every middle-class stick of furniture is perfectly designed to convey the movie's meaning. Just look around the Avery home, and you can see the war of moods. Most everything is a calm blue, with the occasional touch of white, but then there are trouble spots like the red couch, brief territories where the rainbow runs hot. There is also the orange dress that Ed buys Lou. It makes her stand out from everything. Did he give it to her to serve as a warning sign, a symbol reminding him not to trust her? Or is the fact that she is wearing it akin to waving a red flag at a bull? Later, there is a red warning light outside of Ed's hospital room. Red for danger! The thing is, it's Lou that eventually has to take charge and fix things. 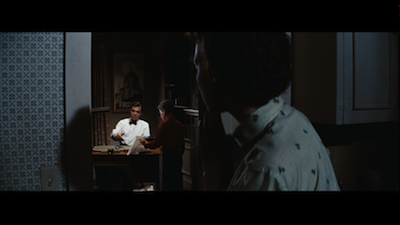 The final act of Bigger Than Life very nearly turns into a slasher movie. 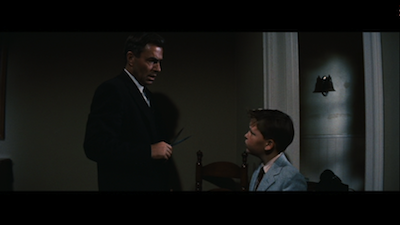 Ed holds scissors over his son, an implied threat that he then voices as very real. Lou tiptoes around the house, scared of attracting the beast's attention, surreptitiously calling for help over the phone and hoping to sneak out. She uses her wiles to placate him briefly, buying enough time to let others intervene. Back at the hospital, the doctors try to cut her out, suggesting that, as a woman, she can't control her emotions. Throughout Bigger Than Life, people have said similar, and Lou has even been called an idiot. Yet, she's always the one who has to clean up for her manic husband, who has to take charge and stay calm. In the end, she's the only one who believes in him. Her expression of faith in all the things he's denied, and her rejection of the chemical faith the presiding powers want her to have, ends up being the Averies' salvation. Again, Nicholas Ray borrows from outside the sudsy genre. His brightly colored family drama ends like a horror movie. The sun rises, the evil passes, Scarlett O'Hara standing outside Tara and swearing to never go off her rocker again. It's amazing what Ray has done. He has taken all the tropes of the Hollywood melodrama, the image of the American family, the colorful palette of Technicolor, and the epic sprawl of Cinemascope, and he has created a darkly subversive movie. Though illuminating the hidden shadows of suburbia is a common theme these days (especially post-Blue Velvet ), it wasn't so back then. The myth of the 1950s was the nuclear family, security in community, etc. In a film noir, it's the city that is wicked, and getting out of it means safety and a place to hide. Hitchcock's splendid 1943 film Shadow of a Doubt had Joseph Cotton introduce murder to Anytown U.S.A., but it hadn't been there before. Hitchcock was saying that evil could lurk in our families, but there was still something "other" about the visiting uncle. But Ray and his writers were putting the iniquity right there in the center of it all. The villain was one of the best of us, a well-spoken teacher, a trusted individual. And it was all the trappings of this kind of life, everything he worked two jobs to earn, that did it to him. 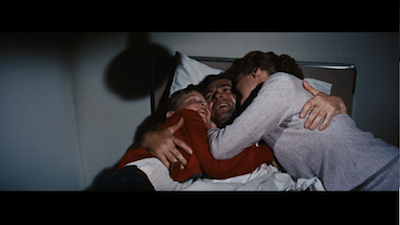 If families in 1956 did happen to catch a matinee of Bigger Than Life, daddy must have gotten some strange looks on the way home. 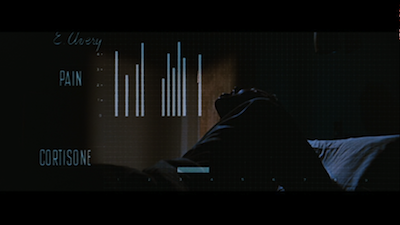 Which is what made the film so startling in its rebellion, the way it plants these radical ideas. I would guess its failure on release was not because it was unbelievable, but because it was too believable. Just like Wilder's Ace in the Hole [review], it told America too much about itself, and so America rejected it. Except now we know that Wilder and Ray were both right, that America should have been scared; that they are more right now than ever is the scariest part of all. 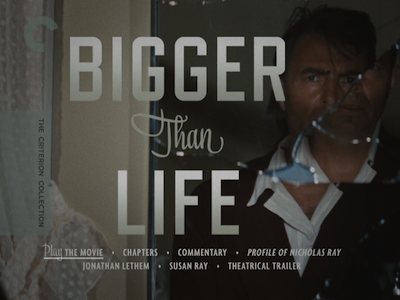 Watch the trailer for Bigger Than Life.